In addition to the other outstanding services we offer here at Kuenzi Turf and Nursery, we also produce and offer to you our high quality sod. We produce about 250 acres of high quality sod each year, paying close attention to detail and everything that goes into growing our beautiful and green sod and turf grass. The experts here love their profession and it shows through the perfection of the products they grow and nurture. We serve a wide variety of different customers, including quality landscape contractors, golf courses, architects and homeowners in the Northwest Oregon and Southwest Washington areas. So whether you’re a family man in the suburbs or a commercial property owner in the city, it doesn’t matter. We’ll provide you with the excellent services and products you need to keep your property looking beautiful. And now we even offer different alternative options for your sod. 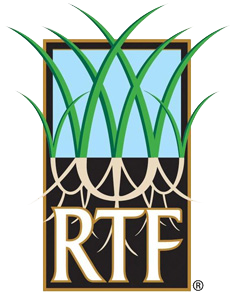 You now can choose between Perennial Ryegrass Sod or RTF® Sod. Not only is our sod and turf grass top notch and aesthetically pleasing, but it is also environmentally friendly as well. In an era of global warming scares and various environmental problems, it is important be maintain and spread awareness on environmental protection. One way you can contribute to the effort is by using our turf grass. The dense and plush grass we grow emits vast amounts of oxygen into the air, which is healthy for you and well as the environment. Not to mention it aids in providing an extra safety barrier in areas of high traffic and activity. For more information on all the benefits of turf grass, visit our turf grass information page! For a pallet drop off location in the Portland or Vancouver area please visit our ‘Retail Locations’ webpage for a location nearest you. Dropping off your pallets and getting supplies makes working with Kuenzi Turf & Nursery convenient and profitable! RTF® Sod EXCLUSIVELY GROWN by Kuenzi Turf & Nursery!